Missing teeth can create many challenges besides just the obvious aesthetic issues. Spaces between teeth can trap food and attract bacteria, contributing to further problems like tooth decay, bad breath, and further tooth loss. If left untreated, these problems can accelerate to jawbone deterioration, muscle atrophy, and an aged facial appearance. Luckily, dental implants can help prevent or reverse these conditions and give you your smile back. Continue reading to learn more details about this amazing tooth replacement option and how it differs from real teeth. Dental implants are basically made up of three parts: a fixture, an abutment, and a crown. Here is some additional detail about the individual three parts of a dental implant. 1) The Fixture: A fixture is an artificial tooth root that is surgically attached to your jawbone. Titanium is used for this piece because it has been shown to be biocompatible and jawbone material can naturally integrate with the dental implant. This part of the implant is critical because it will support your new tooth once it is fully healed. 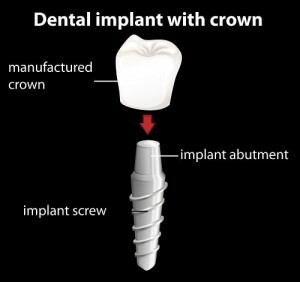 2) The Abutment: The abutment is a connector piece between the fixture (artificial tooth root) and the crown (replacement tooth). This piece is critical in keeping the replacement tooth firmly in place and providing an invisible piece for the crown to attach to. 3) The Crown: The crown is your new, natural-looking replacement tooth and the last piece installed during the dental implant process. Our doctors will use years of education and experience to ensure that this piece perfectly blends in with your other teeth. How Do Dental Implants Differ From Your Other Teeth? Natural teeth and dental implants look very similar, but they are actually different in some very important ways. The most important differences are in the way they attach to the surrounding bone, connecting fibers, and their response to dental disease. Here are some of the differences. Natural teeth attach to the bone surrounding them by small ligaments made up of bunches of collagen fibers. Alternatively, dental implants fuse directly to the bone without the need for collagen fibers. Gum tissues also attach to the root of a tooth with collagen fibers. However, gum tissues can only stick to the surface of dental implants, so again the collagen fibers are not necessary. Teeth are susceptible to decay and may need root canal treatment if the root dies. Dental implants are metal fused to your jawbone. This means they do not decay and they never need root canal therapy. Teeth may also be susceptible to periodontal (gum) disease, while dental implants are susceptible to a condition called peri-implantitis. If patients experience this response, it is usually an inflammatory problem that impacts the tissues surrounding the implant. If left untreated, peri-implantitis can cause disintegration of the bone that holds the implant and ultimately dental implant failure. Now that you know all the critical details about what dental implants are, why not take a look at who is a good candidate for this treatment? You can also check out the rest of our Dental Implant InfoSite, which was created to help patients just like you become familiar with the process, financing, and other important details. We offer many excellent options to pay for your restored smile, so we encourage you to get started today by calling Mavis Dental Centre or Dentistry In The Village to schedule your no-obligation dental implant consultation.